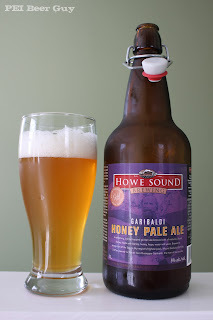 Second beer from Howe Sound Brewing Company in BC, even though this is the first review of the two I have actually finished and posted. 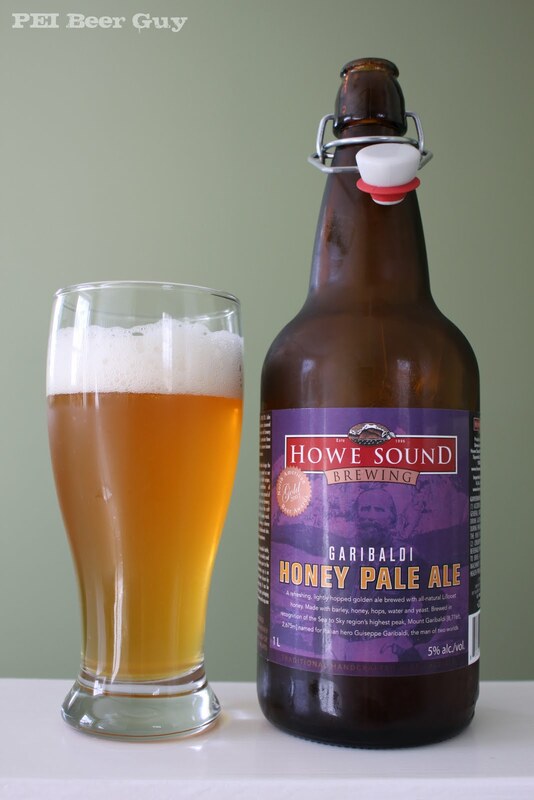 The look of this beer is a slightly hazy, golden honey-yellow (what a shock). There is a nice bit of head that has a bit of creaminess and dimpling on top as it goes down over the first few minutes. Just a few random dots of head stick to the inside of the glass. Maybe it's because I have a cold, but I find that its aroma reminds me of a few different styles in different ways. It smells a bit like a weizen or wheat beer. It also reminds me of some pale lagers, without the slightly sulfuric, or what I have called in the past, "Euro lager" smell (think Heineken or Grolsch). Honey's in there, but I find it subtle. I also get a bit of apple. It brings up memories of things like some saisons & triples, in that it has these bright, natural flavours, but the reins on them here have been pulled back - they're muted. In the flavour is honey (a bit in the feel, too). It gets stronger the more you drink of it. A yeasty finish brings up the mentality of a weizen/triple/saison again. The carbonation may be a bit on the sharp side, but it's nice and bright at least, for this light ale. The finish is on the strong side of lightly bitter, which is kind of nice. It's got a bit of a stickiness to it in the finish, but overall, it's dry. Overall, this was just a good beer. Nothing about it wowed me, but it was pretty solid. Admittedly, I am at the tail end of a cold at the moment. So... maybe there are some things I'm missing... but cut me some slack! I've been on March Break, a time when I thought I could really dig into some new brews, and ended up unable to enjoy any of the beer I recently added to my basement. I figured I had to dip into something before my "break" was up, whether my sniffer & taster were at 100% or not.